Good morning, how is your week going? How did you spend your Easter weekend? Today we are bringing you a fun surprise blog filled with elegant inspiration featuring the new 8x8 Insta-Album and elegant pocket dies. These just became available today for everyone! 8x8 Insta-Album: Have you been eager to try your hand at putting together a beautiful flip fold album, but don't know where to begin? This innovative and perfectly sized 8x8 coffee table book makes it quick and easy to preserve those precious memories with flip and fold out elements that will add fun and beauty to your project. Engineered to hold an abundance of photos, this album comes with pre-attached fold out pages, which takes the work and worry out of the overwhelming album assembly process and allows you to delve straight into the fun of decorating and adding your photos! Elegant Pocket Dies: Adding pockets to cards, layouts and heirloom albums should be simple and easy to do! However, we all know from experience that this is not necessarily the case. The new innovative Decorative Pocket Dies are developed to make creating pockets fun and stress-free. Quick and easy to use, create pockets that are perfect for your paper-crafted projects adding both interest and beauty to your project! Special Savings: The 8" x 8" Insta-Album & Elegant Pocket Die Bundle has a 10% discount, only available until April 27th or while supplies last! Your new collection will arrive packaged in a transparent zipper bag with hot pink trim, great for keeping organized. Get yours today to ensure that you don't miss out on this special savings! The design team members are showcasing many different ways to use this new album and dies along with a videos to learn the step by step process to create album the EZ way. Watch this video and join Emma Lou in the Heartfelt Creations craft room as she shares the wonderful features of this premade album base...from details on how to decorate using your favorite paper collection, adding magnetic closures, as well as how to die cut a decorative pocket perfect for tag and photo inserts! Join Emma Lou in this video as she walks you through each of the Elegant Pocket and Accent Dies within this collection, sharing just how quick and EZ it is to accomplish die cutting gorgeous interactive pockets, shaped note cards, and beautiful accent pieces perfect for all of your paper crafting creations! For more tips on creating the 3D blossoms, watch the tutorial at https://youtu.be/HirfUN8NEYY. Instructions: To see a closeup of this card, follow the link here. For base cut a piece of clear cardstock to 6 x 7.5". Score a line on 3" mark on the smaller side and fold it. Diecut 2 of adorn it pocket accents die from white cardstock. Fussy cut 2 piece of pattern paper from the designer paper collection according to die cut. Apply clear dry glue on die cuts and add glitter on it. Glue both die cuts on pattern paper. Then glue it on clear cardstock sheet as shown in picture. For frame, cut a frame from white cardstock using frame Regal frame and accent die and one background frame from pattern paper. Also cut a base frame from white cardstock. Glue a photo on white cardstock frame. Also glue both frame on it as shown. Glue frame on base using dimensional tape. Diecut 2 of the Regal pocket and accents die from white cardstock and glue it on the back side of frame. To create flowers, stamp oakberry lane blossoms on deluxe flower shaping paper using plum archival ink. Also stamp leaves using library green Archival. Diecut flowers and leaves with coordinating die. Paint flowers with sunflower archival and cactus flower ink. Leaves are painted with leaf green and sunflower inks. Shape flowers and leaves using flower shaping mold. Complete the flowers adding stamens and glitter using clear dry glue. Arrange flowers and leaves using hot melted glue as shown. Stamp sentiment on watercolor paper using black archival and cut with coordinating die. Paint sentiment using zig markers and glue it on card using dimensional tape. Instructions: Cut a piece of white cardstock 8 1/2" x 6 1/2" and score at 4 1/4" and fold. Die cut the card base using the outer edge of the outer die of HCD1-7248 Regal Frame & Accents Die set slightly over the folded edge. Die cut another outer edge and adhere to the front of the card. Die cut the outer decorative edge out of white cardstock and add Frosting Powder to the outer decorative edge before adhering to the card front. Die cut the inner decorative die out of white cardstock and add Frosting Powder to the lattice with Dries Clear glue on a damp sponge. Adhere to the card front. 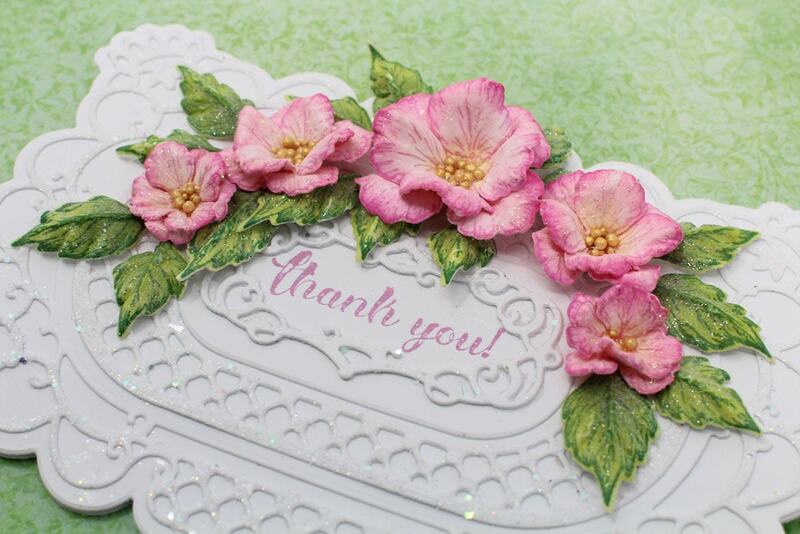 Stamp the 'thank you' sentiment from the HCPC-3846 Thank You Sentiments set onto a piece of white cardstock in Magenta Hue ink and die cut using the plain label die. Die cut two of the inner decorative dies out of white cardstock and adhere together. Add Frosting Powder using Dries Clear glue on a damp sponge to the die cut and then adhere the decorative die to frame the sentiment. Instructions: Card size is 4 x 6". Take 8 1/2 x 6" white cardstock, score and fold at 4 1/4". 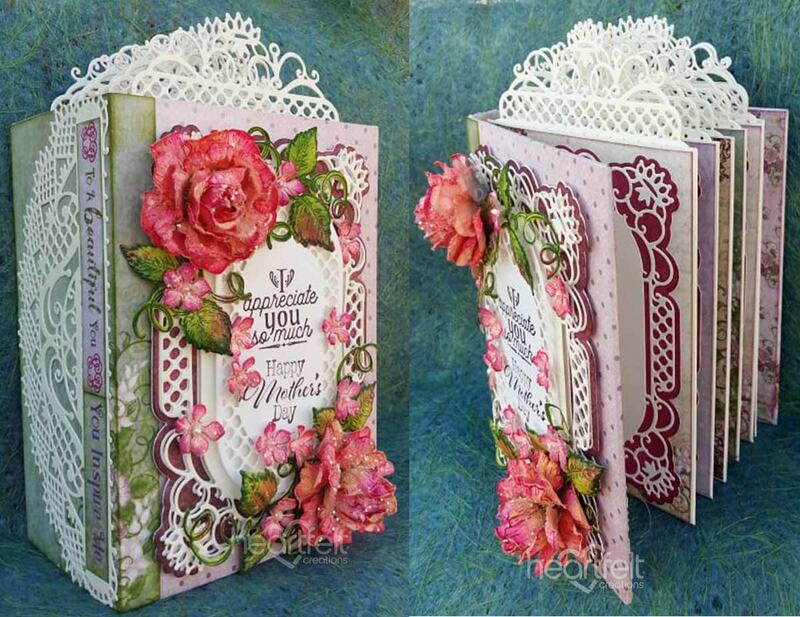 Using Regal Frame & Accents outline, die cut card base, being careful not to cut off fold. Choose paper from the Sugarspun paper collection, using Regal Frame & Accents Die, die cut all sizes. Arrange on card, adhering each layer using 3D foam tape. Fussy cut sentiment using paper collection as shown, and place using 3D tape. To create flowers, stamp the Large Sweet Peony cling stamp set onto Deluxe Flower Shaping Paper with Ranger Archival Ink Pad - Red Geranium and die cut using the coordinating dies. Colour with Ranger Archival Ink Pad - Tea Rose. You will need two petals for each flower to create flowers. Layer the petals together using the hot glue gun, making sure to offset them. Use a paper piercer to make a hole in the middle and pull the stamens through. Add a little hot glue to the underside of the flower to adhere. and sprinkle with Ultrafine transparent glitter. Using Floral Basics Shaping Mold to shape flowers as tutorial shows. Stamp the leaves using Leafy Accents Cling Stamp set, onto the white cardstock with StazOn Ink Pad - Leaf Green, die cut with the coordinating die. Shade using this same ink and shape. Shape leaves using 3D Leafy Accents Shaping Mold. Adhere the flowers and leaves attached using a hot glue gun. Arrange flowers and leaves on card as shown. Sponge the petals with dries clear adhesive and sprinkle with Rajni's Crystal Clear glitter. Instructions: To see more of this album, click here. Begin by distressing all the edges of all the pages of the Insta Album with Espresso Distress ink. Cut papers to the size marked on the album pages from the paper collection coordinating the design according to choice. Distress all the pages with Distress ink. Attach magnets with clear glue on placed marked for magnet. Adhere the patterned paper on the pages. Stamp the peony flower in Vibrant Fuchsia ink, colour with same colour and die cut. Mist the flowers with water and shape with groove golf tools. Layer them together and add Go Man Go prills. Stamp the leaves in Library Green ink and colour with Leaf Green ink. Die cut with matching die and shape in the 3D shaping mold. Layer together in desired layers, create flower buds, pierce the center of the buds, and add stamen. 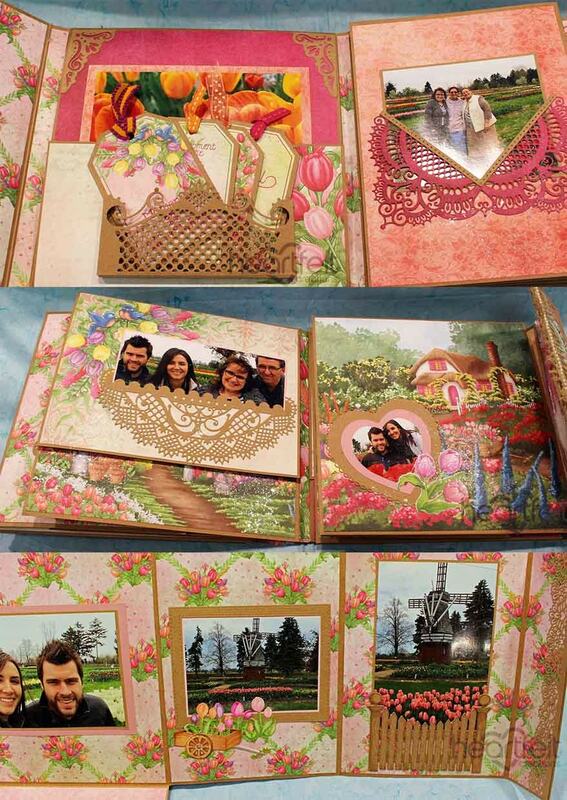 Add the frames, pockets, die cuts and pictures on the album pages. Decorate with the different die cuts and flowers. Stamp the Backyard Blossoms with Jet Black ink and die cut. Color with Zig Markers. Arrange as desired throughout album. Create a 2-inch belly band for album cover from kraft cardstock. Add patterned paper layered with more kraft cardstock and distress the edges. Stamp sentiment on die cut. Add to belly band. Arrange the flowers and leaves on the belly band. Add the twine and charms. Instructions: Card size is 7 1/4 x 7 1/4". Cut one piece of white cardstock 7 1/4 x 7 1/4" and one piece 8 1/4 x 7 1/4". Score the larger piece at 1" on the longer side, fold and round all of the corners on both pieces using a corner rounder. Adhere the two pieces together using dries clear adhesive to create the card base. Cut a piece of melon mambo cardstock 7 x 7", round the corners and adhere to the card base. Cut another piece of melon mambo 7 1/8 x 7 1/8", round the corners and adhere to the inside of the card. Diecut two of the Adorn It Pocket Accents, sponge with dries clear adhesive, sprinkle with Rajni Chawla's Crystal Clear glitter and set aside to dry. Cut white cardstock to 2 1/4 x 6 3/4", round the corners, place in a floral embossing folder, run through the diecutting machine and ink the edges with Vibrant Fuchsia ink. Adhere the two Adorn It Accents to the back of the embossed cardstock, one on each side to form a circle. Adhere to the card base using dimensional squares. Stamp multiple large and some small Sweet Peonies on Deluxe Flower Shaping Paper using Vibrant Fuchsia ink and color with Vivid Chartreuse and Vibrant Fuchsia inks. Stamp some small Sweet Peonies using Forget-Me-Not ink and color with Vivid Chartreuse and Forget-Me-Not inks and diecut using coordinating dies. Place the flowers in the Floral Basics Mold, spritz with water, run through the diecutting machine and finish shaping using the Deluxe Flower Shaping kit. Watch Emma Lou's video above to see how to create beautiful peonies. When shaped, sponge with dries clear adhesive and sprinkle with Rajni Chawla's Crystal Clear. Add Lettuce Entertain You Prills to the flower centers. Stamp the Floral Fashionista flowers on Deluxe Flower Shaping Paper using Buttercup ink, color using the same ink, diecut using coordinating dies, spritz with water, place in the Petite Floral Mold and run through the diecutting machine. Pierce the centers and add a stamen to each flower. Stamp the leaves from the Classic Rose Stamp set on Deluxe Flower Shaping Paper using Archival Olive green ink and color with Olive green and Leaf Green inks. Diecut using the coordinating die, add more Olive green to the edges of each leaf, spritz with water and shape in the rose mold. When dry, sponge with dries clear adhesive and sprinkle with Crystal clear glitter. Stamp the Leafy Accents on Deluxe Flower Shaping Paper using Archival Olive green ink and color with Olive green and Leaf Green inks. Diecut using the coordinating die, add more Olive green to the edges of each leaf, spritz with water and shape in the Leafy Accent mold. When dry, sponge with dries clear adhesive and sprinkle with Crystal clear glitter. Adhere the flowers and leaves to the card front using hot glue. Instructions: To see a closeup of this layout, click here. Take the pattern paper from Cherry Blossom Retreat Paper Collection and adhere it to the backing cardboard and trim off the extra edge. Die cut 4 pieces of white cardstock using the corner die from Fanci-fold Pocket & Accents Die and glue them to the corners of the layout using Designer Dries Clear Adhesive along with the Metal Tip. Die cut 2 each pieces of Adorn It Pocket Accents Die and Regal Pocket Accents Die from white cardstock. Adhere them together at 90 degrees to form an oval. Adhere the photograph on a 4" x 6" piece of white cardstock and adhere the die cuts behind it as shown. Adhere the final piece in the center of our layout using Darice Adhesive Foam Strips. Stamp the Cherry blossoms from Tweet Cherry Blossoms Cling Stamp Set on Deluxe Flower Shaping Paper with Red Geranium and Vermillion Archival Ink Pads. Ink them with the same inks using Stack and Store Daubers. Stamp the leaves from the same stamp set using Olive Archival Ink Pad and ink them with Leaf Green Archival Ink using Stack and Store Daubers. Die cut all the leaves and flowers using the matching dies from Tweet Cherry Blossoms Die. Shape them using 3D Cherry Blossom Shaping Mold and Deluxe Flower Shaping Kit. Add a little Stop Wining Prills to the flower centers. Arrange and adhere all the flowers and leaves as shown. Add few ladybugs made with Red Berry and Ebony Black to the floral arrangement. Add few pearls to the die cuts to add finishing touch. Instructions: To see more of this album, click here. Cover the whole album with papers from the Sugarspun paper collection. For the cover, print a photo and mat it on gold cardstock place the seam binding ribbon under it. For the cover, stamp the peony with Vermillion ink and die cut, then color them with Vibrant Fuchsia, and the center of the flower with Buttercup ink. Shape the flower on your Deluxe shaping mat, make a hole in it and put the stamens in it. Stamp the Leafy Accents with Rich Cocoa on white cardstock, color them with Leaf Green and a little bit of Cocoa and Pink Peony. Shape in the 3D mold. Stamp the backyard flower with Rich Cocoa ink and color with French Ultramarine ink and die cut. Die cut the Regal Pocket die out of black cardstock, place this behind the photo and mat, then place this on the left side of the cover. Add the leaves, then the backyard flower followed by the peony. Cut a sentiment out of the paper and mat it on black cardstock and then on gold cardstock and glue this on the top right corner. Adhere a hinge on the spine of the book and hang a charm on it. I I made the charm of clay using a candy mold. When making charm, attach a necklace hook, before the clay dries. Once dry paint with acrylic pain and cover with lacquer. For the inside page shown, cut a piece of pink cardstock at 7 x 4 1/4" and round the corners. Die cut the large cupcake and cut apart the frosting from the base. Adhere this on the pink cardstock as a tab. Stamp the Sweet Shop, Sweet Shoppe treats and the Sprinkled Confetti Cupcakes stamps on the Flower Shaping paper using Rich Cocoa ink. Color with a mix of Teal Zeal, Vermillion, Leaf Green, Pink Peony, Buttercup, Vibrant Fuchsia and French Ultramarine inks, and die cut. For the tiny pieces you can use the N00 Blender Brush. Place the Sweet Shop Cart on top of the small pocket, only put glue on the right side. Glue on all the sweets and cover it with the Crystal Clear. On the glass you can add some 3D Lacquer, let it dry. Color the cherries with Vermillion ink and add some 3D Lacquer on them, allow to dry! Glue one on top of the cart. Instructions: Cut a 6.5" x 9" piece of Melon Mambo cardstock, score and fold at 4.5" to create a tent fold card base. Select the pale pink paper from the paper collection and die cut the largest solid shape. Cut a thin white piece the same shape, layer together and adhere to the card base. Stamp the wildwood flowers using Highland Heather ink onto the flower shaping paper. Select the 2nd size flower. Die cut and edge the petals with the same color ink. Pierce the center of each flower and thread 1 sparkly stamen into each. Seal at the back of the flower with hot glue and snip off the excess stem from each flower. Die cut the largest fancy regal frame in Melon Mambo cardstock and adhere to the pale pink frame, apply the glue on the center only. Die cut the largest solid oval in the pale pink paper from the collection, then cut a second oval using Melon Mambo cardstock and use the accents die to create the crisscross pattern around the edge of the oval. Adhere this to the pink paper and add to the centre of the card base using foam pads. Stamp the sentiment onto white cardstock using the Melon Mambo ink, cover in clear embossing power, remove excess and heat to set. Die cut with the smallest solid oval, ink the edges with Melon Mambo ink and adhere to the card using foam pads. Stamp the leaves using Mossy Meadow ink onto Granny Apple green cardstock. Die cut and shape lightly. Position the leaves around the edge of the largest oval using dries clear glue and secure the flowers amongst them using hot glue. Instructions: Card base: Cut a white piece of card stock 6" x 12", fold in half with side fold. Cut a 6" square card panel to 5 7/8" square, add to card front. From white card stock, die cut the largest shape from the Regal Frame & Accents die. Die cut 2 of the larger frame, 1 without the center cut out and 1 with the center cut out from white card stock. Glue the 2 frames together. Using a bird design from the Peony Paper collection, cut out with the largest oval die. Insert in the frame. Die cut the Regal Pocket Accents die from white card stock. Adhere to the right side of the frame. Add entire piece to card front. Stamp all flowers and leaves on Deluxe Flower Shaping paper using Dusty Concord for peony, Crimson for Cherry Blossoms and Bamboo Leaves for leaves. Using sponge daubers, ink peony and leaves with same ink. Ink cherry flowers with Passion Pink. Die cut with coordinating dies and then shape with coordinating 3D molds. Use the 3D Floral Basics Shaping Mold for the Peony. Finish shaping with the Flower Shaping Essentials tools. Add stamens to centers of flowers. Add the leaves to the card and then make 2 groups of 3 of the wire stem stamens and add 1 group to the top and 1 group to the bottom of the leaves. Arrange flowers as shown with hot glue. Using the 'Happy Mother's Day' stamp, mask off everything but the word 'mother' and stamp on white card stock with Jet Black. Die cut with the smaller frame. Remove the center with the word. Die cut 2 more frames and glue the 3 frames together. Ink around the edges of the frame and the outside of the stamped piece with Passion Pink. Add the inside piece back into the frame and adhere to the left upper side of the card. Add rhinestones. For tips on creating with the diamond dies, watch the tutorial at https://youtu.be/JwS0Rmysd98. Instructions: To see more of this album, click here. Using the instructions for size for paper and magnets, cut a piece of the paper collection and glue to the front of the album. Also cut a piece for the fold over piece of the cover. Stamp, color and cut out the flower, leaves and the little birds. Run them through the Cherry Blossom 3D Mold after you spritz with water and lay aside to dry. Add Prills to the center of the flower (I colored some of the Minnie Pearl Prills to match my petals using Magenta Hue Archival Ink). Add glitter to the edge of the flowers and the little birds and set aside to dry. Once dry, you have pieces to scatter throughout the album. 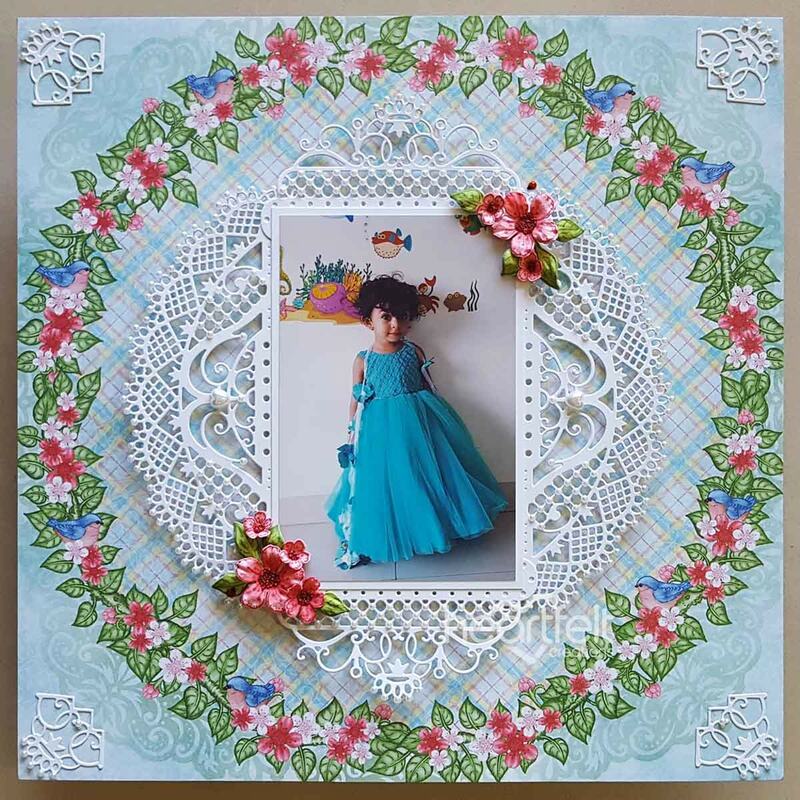 I added little birds, flowers and leaves all across the front of the album and glued the string of pearls down the side. I secured the ribbon to the back of the album using score tape. This is just for a bit of added security and it is also a decorative piece. Page 2: Using the sizes for cutting the paper to fit the page that is printed on the album, cut a piece of the paper to fit the page. Decide where you would like to add the decorative pocket and cut out the slit in the paper. Next run the die through the Vagabond machine with white cardstock. Glue this decorative piece over the slit and then using hot glue, add the bling on a string. Cut out the tag using white card stock and cover it with a piece of the paper collection. Tie the seam binding through the hole and slid the tag down into the slot. Next cut the Decorative die that fits along the bottom of the page and just glue the edges leaving the center open for tags. Glue Bling on a string being careful not to let the hot glue seal the opening. Cut out tags from the paper collection and tie string in the holes for decoration. Page 3: Using the sizes printed on the album for paper sizes, cut a piece of paper to cover the page and glue down. Next cut out the die and glue it to the page. This makes a lovely backdrop for a photo. These dies with this release are stunning and make it so easy to decorate the album and showcase all your lovely photos. For tips on creating with the Tulip Time collection, watch the tutorial at https://youtu.be/rfYMxeNBmJk. Instructions: The finished card measures 6 x 6". Cut white card stock to 12 x 6" and score at 6" on the longer side. Fold to make a horizontal top folding card. Cut a piece of light pink pattern paper from Lilac paper collection a little smaller than card base. Give it a rough edge with the paper distresser, sponge the edges with Magenta Hue ink and adhere to the card front. Cut another piece of lilac patterned paper from the same collection to a slightly smaller size. Repeat previous steps and and attach to card. Cut a 6 x 6 card panel frame from the paper collection. Remove a square part from the center. Adhere to the card front using foam dots. Diecut the pieces shown from Regal Pocket Accents and Regal Frame & Accents white card stock. Add the bigger corner die cut at the bottom right corner and smaller corner on the left top corner. Cut a label and decorative piece from Regal Frame & Accents. Stamp the sentiment in Black ink onto label, distress with Magenta Hue ink and add to the card. Stamp the tulip flowers with plum ink on Deluxe flower shaping paper and diecut with coordinating die. Colour with same colours using a sponge dauber. Shape the flowers in the tulip mold. Stamp the lilac petals in Magenta Hue ink on the same paper, and diecut with coordinating die. Color lilacs with same ink. Shape the lilacs in the Lilac shaping mold. Layer the tulip in double layers and add stamens. Add stamens to the centers of lilac petals too. Stamp the leaves in Library green ink and colour with leaf green. Shape and mold leaves in the Leafy Accents mold and give further shape with groove golf tools. Finish the card by arranging the flowers and leaves as shown. Instructions: To see a closeup of this layout, click here. Take both sheets of the purple border patterned paper, and cut the top sections off at the 6" mark. Attach the 2 together. Cut a 6" strip of the light purple patterned paper. Distress the edges and adhere up the middle of the layout covering the seam of the 2 patterns. From white cardstock cut 2 of the Adorn It Pocket Accents die. Using the narrow straight edged die from the same set, cut 2 of the slightly darker patterned paper. Adhere the pieces together. From white cardstock cut 1 of the Regal Frame, and using the mat die for the frame cut one from lavender cardstock. Adhere these 2 pieces together using foam tape. Cut your photo using the middle oval die from the same set. Adhere to the mats. Adhere this whole piece to the middle of the layout using 3D foam squares. Adhere the other 2 pieces to the top and bottom of the purple patterned strip. Find and cut out the "Life's Beautiful Moments" sentiment and flag the right end. Adhere to the right of the matted photo. Stamp and die cut 2 of the 3 leaf image, and the 2 leaf image using dark brown ink (Stampin Up Early Espresso) onto the Deluxe Flower Shaping Paper. Stamp and die cut 2 sets of the medium and large Cherry Blossoms using grey ink (Archival- Shadow Grey) onto the Deluxe Flower Shaping Paper. Stamp and die cut 1 set of the smallest Cherry Blossoms using grey ink, onto Deluxe Flower Shaping Paper. Stamp and die cut 1 of each of the branch images from Cherry Blossom Retreat using dark brown ink onto white cardstock. Using green ink (ColorBox Seaweed) and daubers, add color to all of the leaves. Using light pink ink (Worn Lipstick) and daubers, add color to the middle of each of the flower images. Shape the flowers and leaves using the 3D Cherry Blossom Shaping Mold. Using a liquid adhesive, add Pink Tu-Tu Prills to the middle of all of the flowers, and let dry. Add a branch to either side of the matted photo using 3D foam squares. Add 1 large, 3 medium and 1 small Cherry Blossom to each branch. Add the 2 leaf clusters and a medium Cherry Blossom to the top and bottom of the photo mat. Add the 3 leaf clusters, 1 large flower and 2 small flowers to the top and bottom diecut. Instructions: To see more of this album, click here. Follow the sizes on the cover and cut 2 from the paper pack, one for the front and one for the back. Cover the side of the front also and add the WT6105 Frilly Flourish Swirl Silver Rhinestone and bling on a roll down the side. For the next page, again follow the size that is printed on the page, cut your paper and along the top add the piece that cuts the split at the top of the paper, next use the HCD1-7245 Adorn It Pocket Accents Die and die cut it out with white cardstock. Apply glue and adhere in place being careful to not glue the lower part so you can slide the tag in. Use the HCD1-7202 Album Tags and Accents Die and die cut out with white cardstock, use the inside part of that tag and cut your picture out, adhere together and slide in place. Use the HCD1-783 Border Essentials Die along with the HCD2-751 Cut Mat Create 2A Die and HCD2-752 Cut Mat Create 2B Die to complete the film strip at the bottom. Cut the designer paper according to the correct size that is printed on the album page and adhere to that page. Cut 2 of the HCD1-7161 Sweetheart Borders Die out using white cardstock, adhere one at the top of the page and one at the bottom. Add Bling on a Roll along the edge. With white cardstock cut the background out of the HCD1-7248 Regal Frame & Accents Die, adhere to the center of the page. Die cut the next part out of some of the designer paper, add to the frame. Use the center part of the set and die cut your picture out, adhere to the page. Instructions: See more of this album here. Or for more inspiration and photos please visit my blog here. Front and sides of album - Cut a piece of cream paper 2" x 8" and adhere to the sides. Cut a piece of Wild Wasabi cardstock 2" x 7 3/4" and using the lace edge die from the HCD1-7202 Album Tags & Accents Dies set cut both edges and adhere to the cream paper. Cut a piece of Iris cardstock 3/4" x 7 3/4" and adhere to the green strip. Cut the lilac patterned zip strip 7 3/4" and adhere to the top of the purple card. Die cut the tags out of the patterned paper using the die from HCD1-7201 Ticket & Tag Dies set and add lilac coloured narrow ribbon to them in various lengths and adhere to the top of the side. Make a bow and adhere to the top covering the ends of the ribbons. Add some lilacs over the bow. Cut a piece of umbrella patterned paper 8" x 8" and adhere to left front of the album. Cut a piece of patterned paper and adhere to the right front of the album. Add Nuvo Diamond glitter to the images on both fronts with Dries Clear glue. Die cut the outer eyelet label from white cardstock from the HCD1-7202 Album Tags & Accents Die set. Add Frosting Powder to the outer edge with Dries Clear glue on a damp sponge. Stamp the "Moments to Remember' sentiment from the HCPC-3813 Today's Quotes stamp set on light purple patterned paper. Die cut the label using the inner coordinating die and adhere to the outer die cut. Adhere to the left front as shown. Die cut two large corners from the HCD1-7247 Regal Pocket & Accents Die set out of white cardstock. Add Frosting Powder to the die cuts with Dries Clear glue on a damp sponge and adhere to the top right and left of the fronts. Centre panel Cut a piece of patterned paper 8" x 8" and die cut the slit with the scalloped edge. Die cut the decorative die from the Adorn it set HCD1-7247 Regal Pocket & Accents Die set out of white cardstock and adhere around the slit. Adhere the paper to the centre panel ensuring the pocket is kept clear. Die cut four small corners from the HCD1-7246 Fanciful Pocket & Accents Die set out of white cardstock and adhere to the four corners. Stamp the small lilac spray image from the HCPC-3816 Lush Lilac Stamp set in Jet Black ink on Iris cardstock. Colour with Zig Clean Colour Brush markers and die cut with the coordinating die. Adhere to the pocket as shown. Die cut two tags using the outer tag dies from the Album Tags & Accents out of white cardstock. Die cut the photos using the inner tag dies and adhere to the larger tag dies and tuck into the pocket. Top panel Cut a piece of plain cream patterned paper and adhere to the panel. Add a 4" x 6" photo to the centre of the panel. Die cut four corners from the HCD1-7246 Fanciful Pocket & Accents Die set and adhere to the four corners of the photo as shown. Bottom panel Cut a piece of plain cream patterned paper and adhere to the panel. Die cut two large corners from the HCD1-7247 Regal Pocket & Accents Die set out of white cardstock. Stamp the small lilac spray images from the HCPC-3816 Lush Lilac Stamp set in Jet Black ink on Iris cardstock. Colour with Zig Clean Colour Brush markers and die cut with the coordinating die and adhere to the front of the dies. Add the dies to the two corners gluing just the edges to create the pockets. Cut the two panels out of the patterned paper and add to the pockets for journaling. Single panel Cut a piece of patterned paper 6" x 8" and adhere to the front of the panel. Die cut the decorative die from the HCD1-7248 Regal Frame & Accents Die set out of white cardstock and adhere to the middle of the panel. 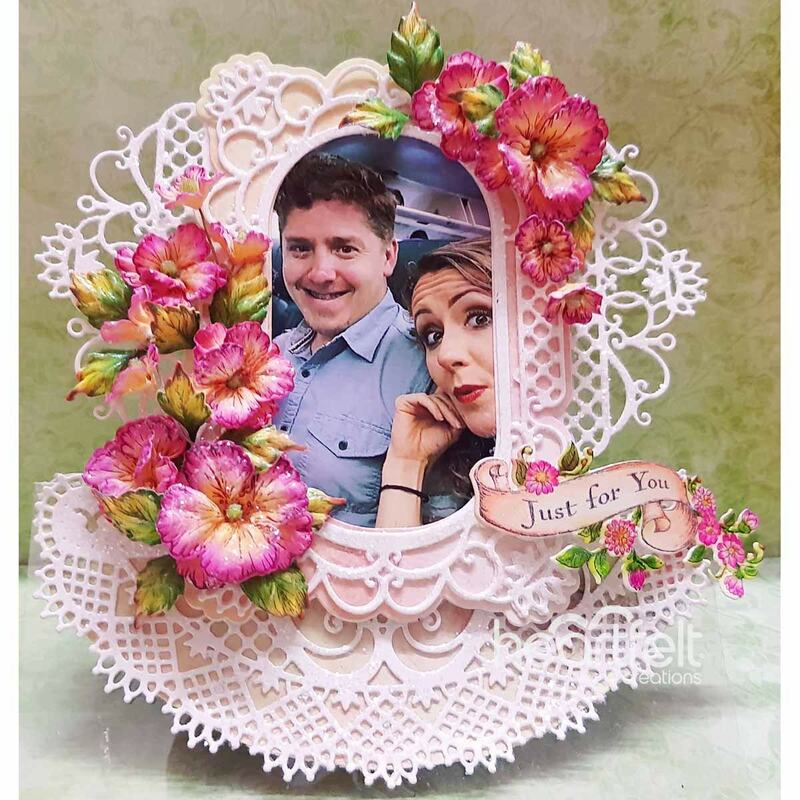 Die cut the photo using the inner plain die from the HCD1-7248 Regal Frame & Accents Die set and adhere to the centre of the decorative die. Die cut four decorative corners from the HCD1-7246 Fanciful Pocket & Accents Die set and adhere to the corners of the panel. Instructions: To see more of this album, click here and here. The 8 X 8 Insta-Album has all paper sizes on the pages for you so cut all the coordinating paper for the entire album. Before gluing any paper in, glue all the magnets to designated spots and also decide where you want pockets to be so that you can cut the slots in the paper before gluing to the book. If you decide later that you want a pocket where you have already glued your paper you can still do it, it's just much harder as you will have to use a blade to cut just the paper not the page where the pocket will go. The pockets on these new dies have different slot opening shapes you can choose which is fun but just remember if you will be taking photos all the way in and out it might be best to just use the straight edge so that nothing gets bent putting it back in over and over. The mats and pockets are all cut with kraft and pink cardstock. The cover: Glue Tulip decorative paper down and cut kraft Lacy Diamond, pink eyelet diamond and photo with Basics Diamond. Cut the Elegant Pocket Accents using kraft and pink background for top and bottom for the left side. Also cut a piece of Jute/pearl trim to size. For the right side of cover cut another piece of trim and 2 corners from the Elegant Pocket Accents from kraft with pink background. Stamp and color a pot and Tulips as well (stamp using Desert Sand and color with Copic Markers). Pop up the pot and flowers. Inside Cover, left side has the small pocket (Regal Pocket Accents) with the ornate topper cut from kraft. Mat photo with pink and kraft. Open the flap just decorated and cut the Fanci-Fold pocket for the bottom panel, cut 2 corners for the top panel and mat a 4 X 6 photo with coordinating paper. Cut 4 tags for the pocket on the bottom panel and stamp them using Vibrant Fuchsia with the Today's Quotes, add ribbon. On the other side, right of Fanci-Fold pocket panel, cut an Ornate Pocket Accent out of dark pink paper or coordinating paper, cut a kraft top trim. Mat photo with kraft. This is all that is shown in photos but there are more panels so keep adding photos and decorative additions to each panel and flap on the left side of Insta-Album. 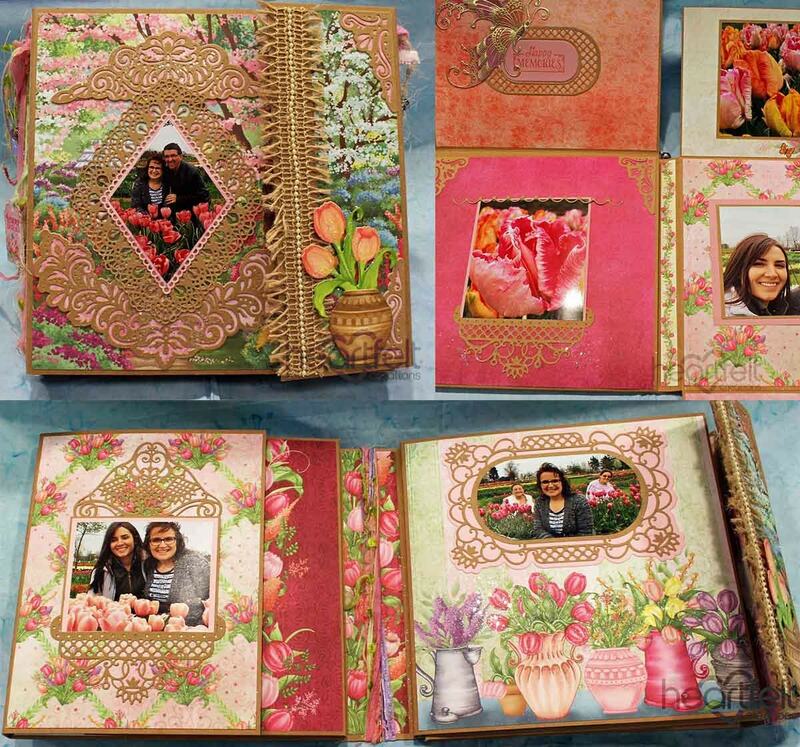 On the right side of album, top open page-Cut Regal frame out of kraft and back with pink. Cut photo to fit inside. Open, decorate the other side top flap with the Adorn It, lift flap and decorate inside with a journaling panel and another photo with the bucket of tulips stamped, colored and die cut to embellish the photo. Move over to the right side [of the right side of album] and cut a kraft eyelet heart, pink heart and photo heart then stamp, color and die cut a bouquet of tulips to embellish photo. Open up again where magnet has pages shut and decorate both left and right panels showing. Left side has an Eyelet Oval cut from kraft with the inside part of the Intricate Swirl Frame cut out of pink over the photo of tulips. Open the flap and decorate with a sentiment, the inside part of the Regal Frame and a butterfly layered stamped on vellum, embossed with gold and colored on the wrong side with the darker pinks of the Copic markers. Sentiment is stamped with Morocco on pink cardstock. The bottom part of this left side is another tulip photo matted with pink in the smaller pocket (Regal Pockets), 2 corners from Elegant Pocket Accents and the slot cut out from the larger Pocket (Adorn It Pocket). On the right, fold all the way out flat, 2 narrow panels, both have the windmill photos embellished by the Fence stamped on kraft and the Tulip Cart stamped on white then colored and die cut along with the row of tulips from the Tulip Cart and Fence set. One of the windmills is framed with the Hand-Stitched Accents. Moving on to the left part of this fold out, cut 2 of the Adorn It Pocket Accents, 1 for the bottom flap and 1 for the top. Mat a photo to slid into the pocket on the bottom flap (the top Adorn It is not made to be a pocket, just decoration. Open these flaps to reveal the inside which is decorated with more photos. The bottom inside uses the Eyelet Hearts and Basic Hearts to cut the photos, mats and embellishments. This is all of the album photographed...There are extra sides to decorate on this side as well. 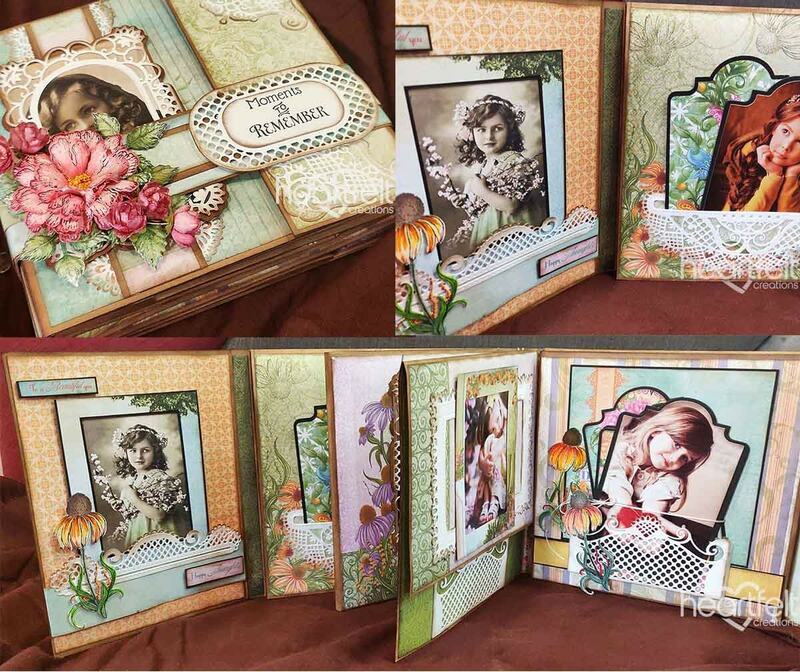 This 8 X 8 book hold a lot of decorations and photos...I love it for an all-in-one scrapbook. Perfect for a special occasion or trip. To finish this album, add fibers, tags and beads to the bindings. Instructions: To see a closeup of this wall hanging, click here. Draw around the oval plaque onto the paper from the pad. Cut the shape making it slightly smaller than the plaque. Distress the edges of the paper and ink the edges using Early Espresso ink. Add Early Espresso ink to the edge of the MDF shape. Die cut 2 Regal Pockets and ink the edges with Soft Suede ink, adhere these to the plaque at the sides so that the top edge of the die cut is just overlapping the edge of the plaque and adhere the paper to the plaque, on top of the remainder of the die cuts. Die cut 2 Adorn It pocket accents and ink the edges with Soft Suede ink. Adhere to the plaque to create an oval shape on top of the paper. Die cut the ornamental tag in crumb cake card and edge the decorative part of the die cut with Early Espresso ink. Stamp the sentiment onto white paper using the Calypso Coral ink, cover with clear embossing powder, remove excess and heat to set. Die cut using the inner rectangle from the tag, edge with Calypso Coral ink and adhere to the ornamental tag die cut. Add to the centre of the plaque using hot glue. Make the leaves: Stamp the Leafy Accents onto Pear Pizzazz cardstock using Call Me Clover ink and die cut. Place face down in the shaping mold and mist with water, place the top onto the mold and run through the die cutting machine. Brush onto the leaves some dries clear adhesive and sprinkle in glitter. Make the flowers:- Stamp the daisies in Soft Suede ink onto the Deluxe Flower shaping paper. Color the flowers using Grapefruit Grove ink in the center and Calypso Coral ink on the petals. Die cut the flowers and color the backs in Calypso Coral and add a little more Calypso Coral to the tips of the petals. Mist the reverse side lightly with water and shape using the flower shaping tools. Use 4 layer of petals for the larger flowers, and 2 or 3 for the smaller flowers. Piece a hole in the center of each flower and thread through a number of stamens, hot glue into place and cut off the excess stamen threads. Add dries clear glue around the edges of the petals and add frosting powder to the flowers, remove any excess. Position the flowers and leaves onto the plaque using hot glue. Instructions: The finished card measures 7 x 5". Cut white card stock to 10 x 7" and score at 5" on the longer side. Fold to make a horizontal top folding card. Cut a piece of pattern paper from paper collection a little smaller than card base and adhere to the card front. Cut another piece of white card stock measuring 6 1/2 x 4 1/2 ". Cut a pattern paper smaller than this and add this on the card stock. Add the card stock with foam dots on the card front, a little towards the right. Diecut the frame from Regal Pocket Accents two times from white cardstock and adhere them together. This gives a dimension to die cuts making them look good. Remove the centre part using the die insert and add the inner inserts as shown on the package. Adhere this to the card front. Cut another frame and cut off the right half, adding it to the left part of the card front. Stamp the Oakberry flowers in Bright Tangelo ink and diecut with matching dies. Colour using a blend of Bright Tangelo and Buttercup ink and shape in the flower shaping mold. Stamp the leaves in Library Green ink and diecut with matching dies. Colour using Leaf Green ink and die cut. Shape in the shaping mold. Layer the flowers with glue and add prills. Attach stamens to the small buds. Stamp a butterfly from the Butterfly dreams collection in Jet Black ink and die cut with matching die, Colour with Bright Tangelo and Buttercup ink. Add to the card. Stamp a Mother's Day using Jet Black ink on small white cardstock strip, ink edges slightly with Buttercup and Black ink. Add sentiment to the card. Instructions: The ready top-fold card from white cardstock measures 5" by 8". To create the top panel, choose the paper from the paper collection, Floral Fashionista and cut to size, 4 1/4" by 7 1/4". Secure the paper in the embossing folder and run it through die cutting machine. Create 2 layers, one from white cardstock and another using gold foiled sheet keeping the border of 1/16" all around. Layer them using foam dots and finally on the ready card base. Cut 4 die cuts from the gold foiled sheet using Fanci-fold Pocket & Accents Die and one solid tag from same gold foiled cardstock using Album Tags and Accents Die. Glue all an extra white die cut to all the gold foiled die cuts for extra strength (optional). Layer the die cuts on the ready card panel as shown slightly overlapping in the center. Cut a long tag die from Ticket and Tags Die set from maroon paper and cover the center as shown. Next, Cut a lacy tag using maroon paper from the paper collection and solid tag from white cardstock using Album Tags and Accents Die. Distress the solid tag softly with Aged Mahogany Distress ink and stamp the image from Classic Rose Vines Cling Stamp set. Also, stamp the sentiment from Just From You Stamp Set with Plum Archival ink. Layer both the tags using foam dots and finally layer them on the ready panel. For Vellum Roses and leaves, Stamp the images from Classic Rose Stamp set, Classic Rose Vines Cling Stamp Set and Lush Lilac Cling Stamp Set with white Color Box ink on Vellum, Sprinkle white heat embossing powder and dust extras in the funnel tray and heat set. Color the flowers using Distress Oxide Seedless Preserves, Carved Pumpkin, Peeled Paint and Twisted Citron. Die cut all the images using their coordinating dies. Shape the flowers using a shaping mold. Press the centers and glue them together to form beautiful flowers. Pick the flower centers using needle tool and secure golden color pearl stamens using tacky glue. To the tiny Lilacs, add golden glitter balls using an adhesive that dries clear. Once all the elements are ready, assemble a small flower bouquet and complete the card by extra sparkle using Rajni Chawla's Crystal clear with the help of adhesive that dries clear. Other Products: Smooth white cardstock, Funnel Tray, Cuttle Bug Embossing Folder, Distress Oxides, Carved Pumpkin, Spiced Marmalade and Peeled Paint, White Heat Embossing Powder, Foam Dots,Tiny Glitter Balls and Peach Pearlescent Cardstock. Instructions: The ready top-fold card from white cardstock measures 7" x 7". To create the top panel, cut peach color pearlescent cardstock measuring 6 1/2" x 6 1/2". Dry emboss it using a cuttlebug embossing folder. Create 2 mats, one from white cardstock and one from kraft cardstock making the borders of 1/16" all around. Layer them together using foam dots on the card panel. Cut 8 die cuts from white card stock using HCD1-7247 Regal Pocket Accents Die and create 4 sets of die cuts by gluing 2 pieces together. Arrange them on the ready card panel as shown. For Vellum Roses and leaves, Stamp the images from Classic Rose Stamp set, Classic Rose Vines Cling Stamp Set and Lush Lilac Cling Stamp Set with white Color Box ink on Vellum, Sprinkle white heat embossing powder and dust extras in the funnel tray and heat set. Color the flowers using Distress Oxide Spiced Marmalade, Carved Pumpkin, Peeled Paint and Twisted Citron. Die cut all the images using their coordinating dies. Shape the flowers using a 3D flower shaping mold. Press the centers and glue them together to form beautiful flowers. Pick the flower centers using needle tool and secure golden color pearl stamens using tacky glue. To the tiny Lilacs, add golden glitter balls using an adhesive that dries clear. Once all the elements are ready, assemble a flower bouquet in the center and complete the card by extra sparkle using Rajni Chawla's Crystal clear with the help of adhesive that dries clear. Also, add a tag cut from Floral Fashionista Collection. Instructions: Cut card base 5.5 x 5.5 inches in white card stock. Cut a piece 4.5 x 5.25 inch of blue designer paper from the Sugarspun Paper Collection. Distress the edges, sponge lightly with Forget-Me-Not ink and attach to card base. Cut out the Fanci-fold Pocket & Accents Die and sponge with Forget Me not, and two of the corner die in the Regal Pocket Accents Die in white cardstock and sponge with Bamboo Leaves. Attach corner dies onto card as pictured. Fold the Fanci-fold Pocket & Accents Die on the fold lines and adhere into a pocket and attach onto card. Stamp the petunias from the Large Classic Petunia Cling Stamp Set in Buttercup, sponge with same, stamp small roses from the Classic Rose Cling Stamp Set in Lulu Lavender and sponge with same, cut out all with corresponding dies and sculpt with the 3D Floral Basics Shaping Mold. Add bead stamens to centers, sponge blossoms with adhesive and cover with Crystal Clear. Stamp, and sponge leaves from the Leafy Accents Cling Stamp Set in Bamboo Leaves, cut out with corresponding dies, sculpt with the 3D Leafy Accents Shaping Mold. Adhere leaves and flowers as seen in photo. Cut out the sentiment from the same paper pad, sponge edges with Forget-Me-Not ink and attach onto card. Instructions: Front Cover Instructions - To see more of this album, click here. Select decorative paper from within the Sugarspun Paper Collection for front cover, sides, backside and flap closure. Cut to size following measurements on Insta-Album. Trim an additional piece of patterned paper to layer over a portion of the paper on flap corner, as well as sentiment strip. Trim a separate sentiment strip to run across front of cover. Ink edges on all pages using Ranger Archival Ink - Buttercup using Stack and Store Daubers. Adhere pieces to Insta-Album as shown. Die cut four of the pocket die cuts from the Regal Pocket Accents Die from white card stock. Using Designer Dries Clear Adhesive and hydra sponge, apply glue to entire die cut and then sprinkle with Crystal Ultrafine Transparent Glitter. Repeat on all die cuts, and then set aside to dry. Stamp two inkings of the large cupcake image from the Sugarspun Cupcake Cling Stamp Set onto white card stock using Ranger Archival Ink - Coffee. Sprinkle both with Embossing Tinsel - Bridal and heat set using heat tool. Using Stack and Store Daubers, color cupcake liner using Ranger Archival Ink - Forget-Me-Not, and frosting using Ranger Archival Ink - Pink Peony. On second stamped image, color bow using Ranger Archival Ink - Buttercup. Die cut using coordinating die. Also die cut a simple backing for the cupcake from white card stock. Using scissors, snip frosting portion off of cupcake die cut. Adhere cupcake liner to die cut white base using Designer Dries Clear Adhesive, and then using pop dots, apply frosting portion. Die cut ribbon from second die cut and adhere to assembled cupcake embellishment with pop dots. Stamp one inking of the cherry image and once again sprinkle with embossing tinsel and heat set. Color using Ranger Archival Ink - Vermillion. Die cut using coordinating die and adhere to cupcake embellishment. Using hydra sponge, apply Designer Dries Clear Adhesive to frosting portion of embellishment and then sprinkle with Rajni Chawla's Dries Clear. Once dry, using fine metal tip and Dries Clear Adhesive, add "Spilled Prills" randomly over frosting. Using Dries Clear Adhesive and fine metal tip, apply Crystal Ultrafine Transparent Glitter accents on cupcake liner. Apply Nuvo Drops - Dries Clear to cherry. Stamp smallest cupcake from Sprinkled Confetti Cupcakes Cling Stamp Set onto white card stock using Ranger Archival Ink - Coffee. Sprinkle with embossing tinsel and heat set. Using Stack and Store Daubers, color cupcake liner using Ranger Archival Ink - Deep Purple, cupcake using Ranger Archival Ink - Pink Peony, frosting using Ranger Archival Ink - Buttercup and cherry using Ranger Archival Ink - Vermillion. Die cut using coordinating die, and then die cut frosting portion with coordinating die. Die cut a simple backing for the cupcake from white card stock. Adhere cupcake liner to base using Designer Dries Clear Adhesive, and frosting portion using pop dots. Using Dries Clear Adhesive, apply Crystal Ultrafine Transparent Glitter to frosting and cupcake liner. Add "Spilled Prills" to frosting and Nuvo Drops - Dries Clear to cherry. Stamp one inking in each Ranger Archival Ink - Cactus Flower and Paradise Teal of cherry blossoms onto Deluxe Flower Shaping Paper. Stamp several inkings of leaves onto Deluxe Flower Shaping Paper using Ranger Archival Ink - Leaf Green. Using Stack and Store Daubers, color foliage using a combination of Ranger Archival Ink - Vivid Chartreuse and Leaf Green. Die cut using coordinating dies. Color cherry blossom centers with Ranger Archival Ink - Buttercup. Add a touch of color to flower petals using Ranger Archival Ink - Pink Peony (to those stamped in Cactus Flower), and Ranger Archival Ink - Forget-Me-Not (to those stamped in Paradise Teal.) Die cut using coordinating dies. Place all blossoms and foliage into 3D Cherry Blossom Shaping Mold, mist lightly with water and pass through 3D Cherry Blossom Shaping Mold. Remove flowers from mold and set aside to dry. Create a pinwheel rosette from two pieces of decorative paper measuring 9" x 2". Score each strip at every 1/4". Fan fold each strip and then adhere them together end to end to create a circle. Die cut two small circles using the Circle Basics Large Die from white card stock. Take fan folded rosette piece and gently press in the center until the circle forms. Using a glue gun, adhere one die cut circle to the front of the rosette and one to the back so rosette keeps shape. Next, position and adhere glittered pocket die cuts around outer edge of rosette using glue gun. Die cut the largest circle from the Circle Basics Large Die from white card stock and adhere to back of rosette to cover assembly mechanics. Using glue gun, adhere cupcake embellishments and florals as shown. Adhere rosette to flap closure using glue gun. Using Designer Dries Clear Adhesive, adhere "You Had me at Yellow" prills to flower centers, and Crystal Ultrafine Transparent Glitter to flower petals, foliage and all preprinted illustrations on designer paper. Apply Nuvo Drops to cover and set aside to dry. Page Instructions - Cut a plain piece of decorative paper to mat page following measurements in Insta-Album. Trim out a portion of decorative paper with cupcake illustrations and adhere to bottom of page mat. Ink all edges using Ranger Archival Ink - Forget-Me-Not. Trim out sentiment panel and ink all edges using Ranger Archival Ink - Buttercup. Marry the two pieces together using sentiment strip. Die cut two pockets into page mat using plain pocket opening die from Regal Pocket Accents Die. Adhere page mat to Insta-Album page. Die cut two decorative pocket die cuts from Regal Pocket Accents Die. Using hydra sponge and Designer Dries Clear Adhesive, sponge adhesive onto die cuts and sprinkle with Crystal Ultrafine Transparent Glitter. Adhere pocket accents over top pocket openings in page. Stamp two inkings of the large cupcake from the Sugarspun Cupcake Cling Stamp Set onto white card stock using Ranger Archival Ink - Coffee. Sprinkle with Embossing Tinsel - Bridal and heat set with heat tool. Using Stack and Store Daubers, color frosting using Ranger Archival Ink - Buttercup, cupcake liner with Ranger Archival Ink - Forget-Me-Not, and the bow on second image using Ranger Archival Ink - Pink Peony. Die cut all pieces using coordinating dies. Also die cut a corresponding die cut from white card stock to use as cupcake backing. Assemble cupcake, adhering cupcake liner to backing, and then frosting using pop dots. Apply ribbon to embellishment using pop dots as well. Stamp heart sprinkle onto white card stock using Ranger Archival Ink - Vermillion, and die cut with coordinating die. Adhere to cupcake. Die cut largest cupcake backing from white card stock. Ink all edges using Ranger Archival Ink - Pink Peony. 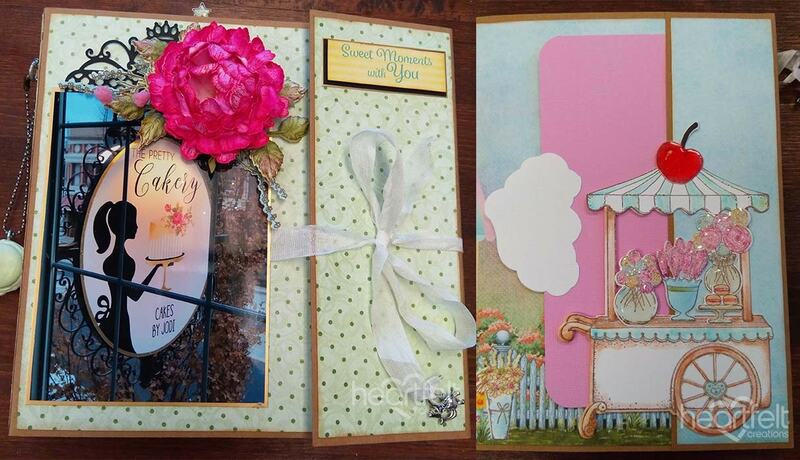 Adhere colored embellishment to large backing to create a journaling spot in mini album. Using Designer Dries Clear Adhesive, apply glitter to cupcake, as well as "Spilled Prills" as sprinkles. Select a tag from the Sugarspun Paper Collection, die cut with coordinating Ticket and Tags Die. Die cut a large coordinating backing from white card stock, and then ink all edges using Ranger Archival Ink - Buttercup. Die cut from white card stock the decorative pull from the Fanci-fold Pocket and Accents Die that matches the pocket dies used. Follow steps listed above to glitter die cut. Adhere to back of preprinted tag, and then adhere tag to tag backing. Using Ranger Archival Ink - Forget-Me-Not, add sentiment from Special Birthday Sentiments Cling Stamp Set. Adhere left over flowers that have been stamped and shaped while completing cover. Adhere prills to flower centers and Crystal Ultrafine Transparent Glitter to foliage and flower petals. Create a small cupcake topper rosette from a piece of decorative paper measuring 1" x 12". Score at every 1/4". Fan fold and then adhere end to end to create a circle. Die cut two small circles using the Circle Basics Large Die from white card stock. Take fan folded rosette piece and gently press in the center until the circle forms. Using a glue gun, adhere one die cut circle to the front of the rosette and one to the back so rosette keeps shape. Die cut the doily like die cut from the Butterfly Kisses Decorative Die and adhere to back of rosette. Die cut a small circle from another piece of patterned paper. Adhere to rosette using glue gun. Follow instructions for small cupcake embellishment as listed above in Front Cover Instructions. Die cut numbers for special birthday and glitter if desired. Add to small cupcake embellishment. Using glue gun, adhere toothpick to back of rosette. Add a large single cherry blossom to side of bottom pocket as shown. Glitter all petals, foliage and preprinted illustrations using fine metal tip and Designer Dries Clear Adhesive. Place cupcake and rosette into bottom pocket, and slip tag into top pocket as shown. Instructions: To create take your Regal Frame & Accents die and diecut the background layer on your white cardstock. This will be your mat piece for the card base. Next diecut the next layer of the die on your gold foil paper. Once done diecut the 3rd layer on white and the final decorative piece on gold foil paper. Adhere all the layers together for your actual card. Now take your sun kissed fleur die and stamp on the vellum paper using the white ink and embossing powder and heat set. Once you have all your sun kissed fleur flowers cut, turn them over and color the back side of the vellum using the yellow, orange ink for the flower and for the leaves use the green. Adhere each of the flowers together using 2 diecut flowers staggering each layer. Shape flowers and leaves. Then top of your flower centers using the prills. For the sentiment simply stamp the happy birthday sentiment in Black ink on white cardstock and layer with a piece of gold foil paper and adhere to the card front. Instructions: The finished box measures 7 x 4-1/2. Cut white cardstock 16 x 12 - 1/2 and score at 4-1/2" and 11-1/2 from the 16" side. Score at 4-1/2 and 8-1/2" from the 12 inch side. Cut along the two horizontal score lines from both the sides till they met the vertical score lines and apply double sides tape to these flaps. Adhere the side flaps to the center flap for creating the box base. Choose pattern paper from the collection and mat the outside and inside of the box. For the lid of the box, cut white cardstock 9 x 6 -1/2" and score at 1 inch from all the four sides. Cut along the two horizontal lines from both the sides till they met the vertical lines. Apply double sided tape to these flaps and adhere them to the center flap. Mat the outside and inside of the lid with pattern paper from the collection. Die cut the center of the lid using second largest die from the Regal Frame & Accents Die set and adhere clear cardstock from the inside of the box with double sided tape. Die cut white cardstock using largest and second largest die from the Regal Frame & Accents Die set and adhere on the lid of the box as shown. Die cut white cardstock twice using Adorn It Pocket Accents Die and Regal Pocket Accents Die and adhere the die cut outs with clear dry glue on the sides of the box base and box lid. Die cut the cupcakes, candy bowl and flower pot images from the paper collection using Sprinkled Confetti Cupcakes Die and Sweet Shoppe Treats Die set. Also die cut out the tags from the paper collection using Album Tags and Accents Die set and tie along the lid of the box with a twine. For the flowers stamp Deluxe Flower Shaping Paper with Tweet Cherry Blossoms Cling Stamp Set using Archival Ink - Carnation Red. For stamping the leaves use Archival ink Library Green, die cut the images with coordinating dies. Color the flower petals with Archival ink - Carnation Red and Leaves with Archival Ink Fern green and Leaf Green. Shape the flowers and leaves using the 3D Cherry Blossom Shaping Mold. For the center of the flowers use Power Outage Prills. Once all the elements are ready arrange them as shown. Apply Crystal Clear glitter on flowers with clear dry glue.